Total Score: 8.66 + Best Value! Introduction: Quantum keeps the hits coming with a completely redesigned Accurist reel. The new Accurist 2 baitcast reel features a lower and sleeker profile, much more durable frame and components, comes in three shimmering colors, and best of all is a better value than ever before. Impressions: In June of last year, we first broke news about the new Quantum products for 2005 and the Accurist 2 was one of the exciting reels we featured in that preview article. Now that we got our hands on these reels, we simply can't stop talking about them. The Accurist AC500CX has a smaller and sleeker profile than its predecessor, and is now constructed to be more sound by using more rugged components with near-zero plastics. 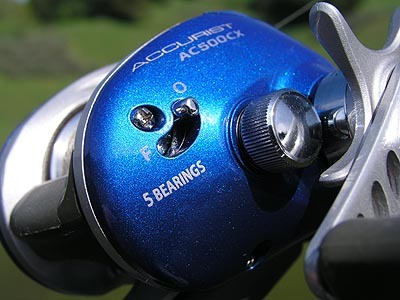 The new AC500CX incorporates 5 bearings, a Flippin' switch, and a couple of the advanced features that we first saw in the Performance Tuned Quantum reels such as the external ACS II cast control and Continuous Anti-Reverse. That's not all! The Quantum Accurist now comes in three breathtaking colors making it possible to match just about any rod for that perfect flipping combo. Field Tests: The Accurist baitcast reel can be used in multiple applications and techniques for various species of fish. Trips into the California Delta were called for in our tests on this reel. The Quantum Accurist features a Flippin' switch and these waterways are one of the best places to test this function as we are able to flip and pitch lures all day. Casting: In its normal casting mode, the Accurist AC500CX can cast plenty far. The free-spool on this reel is first-rate, allowing the braided and mono lines to flow right off the spool without any hesitation as we tossed lures such as crankbaits to soft plastics. The external ACS II adjustable centrifugal cast control system does an excellent job preventing nasty bird nests, and when set on "FREE" it allows the spool to spin nearly frictionless. With that said, we will focus more on its alternative casting feature by employing the Flippin' switch. The Flippin' switch is very simple to operate, but the art of flipping will take some practice. 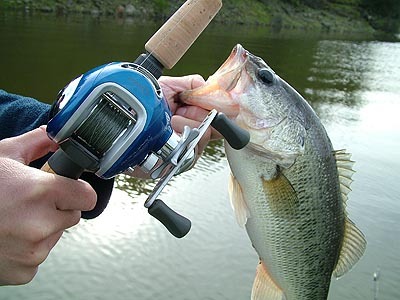 To engage the reel for flipping, just push the switch to the "F" position and you're ready to go. 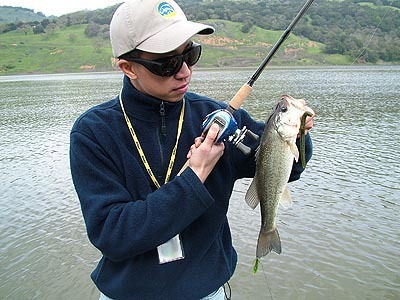 In this technique, the amount of line needed to reach a predetermined target is pulled out of the reel ahead of time and the bait is swung in a pendulum-like manner until it is softly placed at the target. Did we find this Flippin' switch useful? Yes we did. 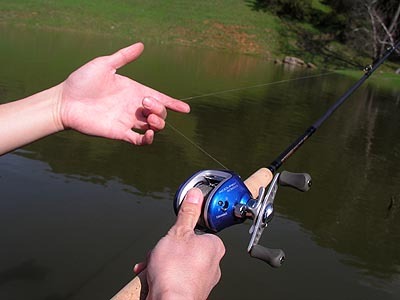 Our field test team consists of anglers that retrieve both right and left handed, and even for those editors that did not need to switch hands after flipping their bait to the targets, having the reel engaged as the bait gently sank in the water left all of us ready for that eventual strike. 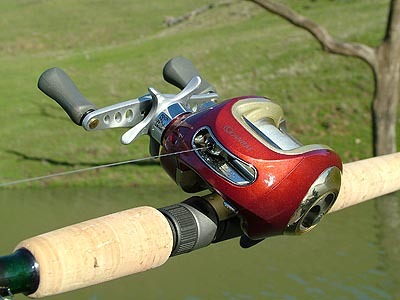 Quantum's Flippin' switch requires the angler to depress the thumb bar to draw out the necessary amount of line out from the reel. This slack line is held in the angler's free hand while the other hand negotiates the rod and reel to gently flip the lure out. Once the thumb bar is released the reel pops back in gear providing instant readiness for hookset without the need to switch hands or turn the handle over to engage the reel. 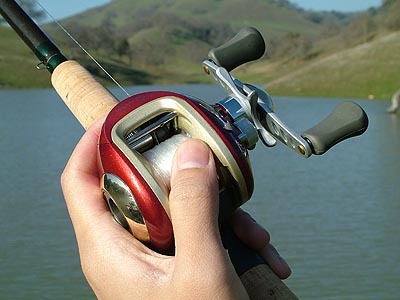 The Flippin' switch makes this technique easier to manage and allows you to focus your attention on hitting targets with each swing rather than fumbling with constantly putting the reel back in gear every time you make a line adjustment. Retrieving: After plenty of hours cranking away on the Accurists we came to the conclusion that this reel has a surprisingly smooth retrieve for a reel that only houses 5 bearings. Each retrieve is not only smooth but surprisingly powerful as well, thanks to the solid one piece aluminum frame and the quality metal internal guts. We were able to give this reel a good workout, ripping jerkbaits for stripers and pulling largemouth bass away from structure with each turn of the handle, and the Accurist responded agreeably. Drag: Click, click, click... yes, the Quantum Accurist has a clicker and now a metal star drag control to match its new sleek appearance. In our lab tests we found the drag to be quite smooth and when fully tightened it can produce a total drag pressure of 7 pounds. When we put the drag system up against hard hitting stripers we were further impressed by how smooth the drag was. You won't experience any jerkiness while the line is being taken, even at the higher settings. Ergonomics: Compared to the old style Accurist, the 2005 model is simply outstanding in ergonomics. Even with a slight increase in weight, the AC500CX now has a smaller profile and palming feels much more natural. We were able to use this reel for an entire day without fatigue, and matched with the G. Loomis MRB843C rod it felt absolutely balanced making this pair a fantastic flipping combo. Durability: The newly redesigned baitcast reel is entirely solid. It feels great in your hands, and the one piece aluminum frame shows no signs of frailty even when we put it up against larger fish. The Accurist 2 now uses nearly zero plastics compared to the past model, and it's bound to last season after season. The finish on these reels is really nice. Not only do they look incredible, but they are also finished with multiple layers to prevent accidental scratches. Great appearance, good performance, and a great value! Price: The Quantum Accurist 2 is an outstanding reel. Not only does it perform well, it's also built with a sleek and lower profile on a sound frame, and it does so with a price tag under $80! Built with mostly metal components and packed with features, not many of its competitors can match it in overall value. Conclusion: Completely redesigned, the 2005 Quantum Accurist baitcaster is a great reel in terms of features and performance, and a flat out terrific reel when you consider the low price tag. Now available in 3 exciting colors, this reel has a more ergonomic shape and retrieves are smoother than ever, the enhanced drag system can handle larger running fish, and each and every cast is effortless. 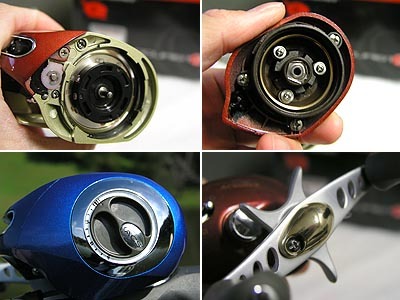 The additional feature of a Flippin' switch allows bass anglers to use this reel with multiple types of lures, both in open water and in close encounters. The technique of flipping is now easier for anglers of multiple skill levels to manage. The combination of quality craftsmanship, performance, and great value makes the Quantum Accurist baitcast reel a worthy recipient of TackleTour's Best Value Award! The new Accurist reel will definitely be one of the best selling sub-100 dollar reels on the market for 2005, and around the mid-year time frame a left-handed version will be available.